230 Ash is currently under construction in Old Town, and will include 133 residential units over ground floor retail. The Daily Journal of Commerce wrote about an “exciting time” for 230 Ash, the first of the Goodman family’s ‘Ankeny Blocks’* to be developed. The project is currently being framed, and is expected to be complete in October. The Willamette Week wrote about a “beloved urban hot tub oasis” that is now under threat, now that the parking spaces it leased at 2821 NE Everett St is being redeveloped into a 118-unit apartment building. Mayor Wheeler supports Speaker Kotek’s proposal to end the ban on duplexes, triplexes and fourplexes in Oregon cities of over 10,000 people, writes the Willamette Week. He also offered “measured support” for the tenant protections and rent control bill proposed. The Business Tribune wrote about the Hoxton Hotel and Woodlark Hotel “find authenticity and ambiance in historic architecture“. The Oregonian reported on plans to redevelop a site at 936 SW Washington St—currently home to Portland’s largest and best known food cart pod—with a 33-story tower, which would include office space, hotel rooms and apartments. The site is currently owned by the Goodman family, who the Daily Journal of Commerce reports have projects aplenty in progress. * Other current developments of theirs include 230 Ash, Eleven West, and the Moxy Hotel. The Portland Business Journal has the latest information on OMSI‘s ambitious Central Eastside expansion ambitions. The Willamette Week covered the City’s annual State of Housing in Portland report, which includes some hope for struggling renters. The Portland Business Journal reported that neighbors are opposing the Adidas Campus Expansion plans in North Portland. 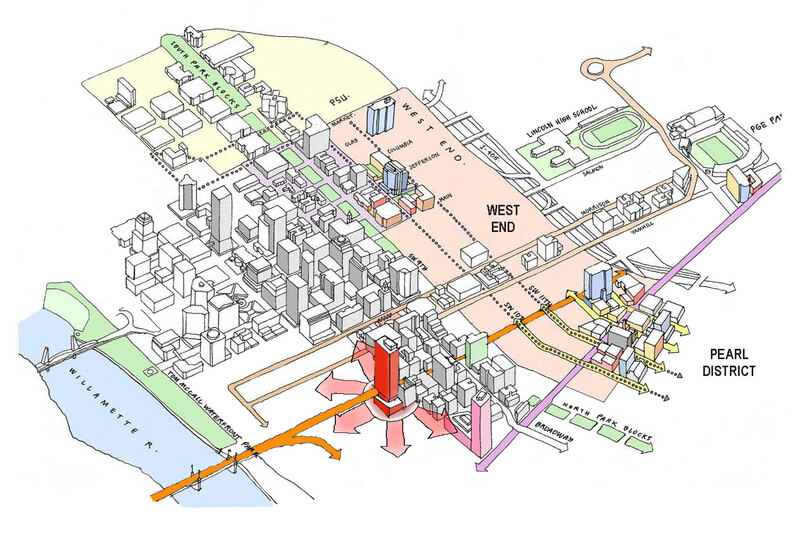 The Portland Design Commission has however shown early support for the proposal. 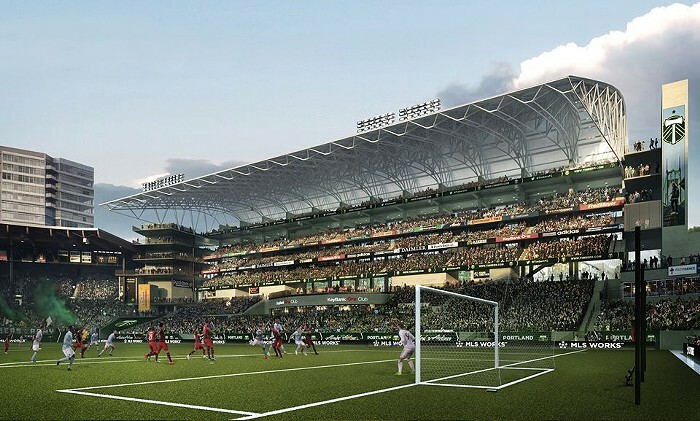 Portland Public Schools has “thrown a curveball” at the Portland Diamond Project‘s plans for an MLB stadium in the Rose Quarter, reports the Willamette Week. The Portland Business Journal reports that the group behind the project isn’t vexed by the proposed bidding process for the site. 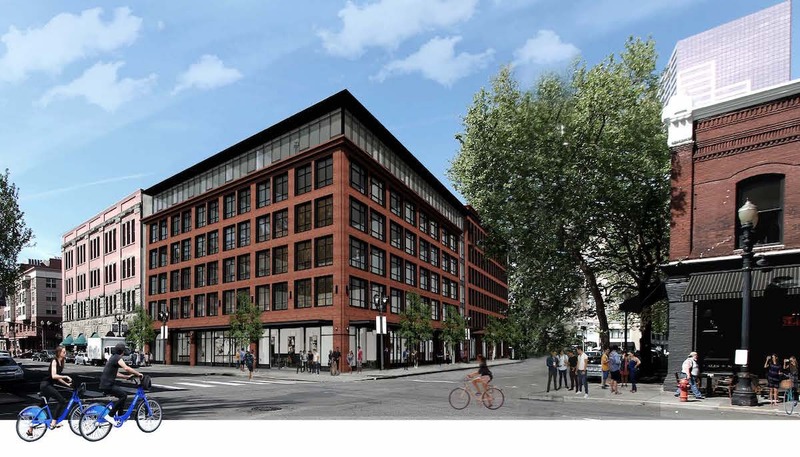 The Urban Works Real Estate blog published construction updates on the Taylor Works Building at SE 2nd & Taylor, which is undergoing a major renovation and alteration. The Business Tribune wrote about Continuum Partners, the developer that has been chosen to lead the Broadway Corridor redevelopment. Every week, the Bureau of Development Services publishes lists of Early Assistance applications, Land Use Reviews and Building Permits processed in the previous week. We publish the highlights. This post covers April 9th to April 15th, 2018. 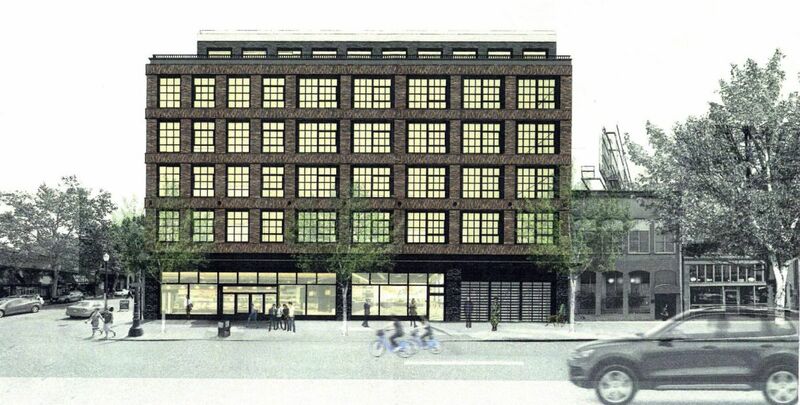 7-story mixed use building (177 units) with 8,800 square feet of retail space on the ground floor. Twenty-seven parking spaces are proposed with access from SW 17th. Two loading spaces are proposed in the structured parking area. Current code: Proposal is for 5 unit condominiums. More than likely – future code -with not a lot of impact to the site/project by the changes: New construction of 30 units of multi-dwelling housing development. It will be two (2) 3-story buildings to be constructed in two phases. All units will be sold as permanently affordable condo through the City of Portland preference policy. This project is to move through the GATR fast-track process with oversight from PHB. Construction of new 7-story, 174,000 sq ft classroom/lab/office building. See concurrent DZM, AD review (case # is: LU 18-151941 DZM, AD). Construction of new 7-story, 174,000 sq ft classroom/lab/office building. See concurrent Conditional Use Case (LU 18-151969). 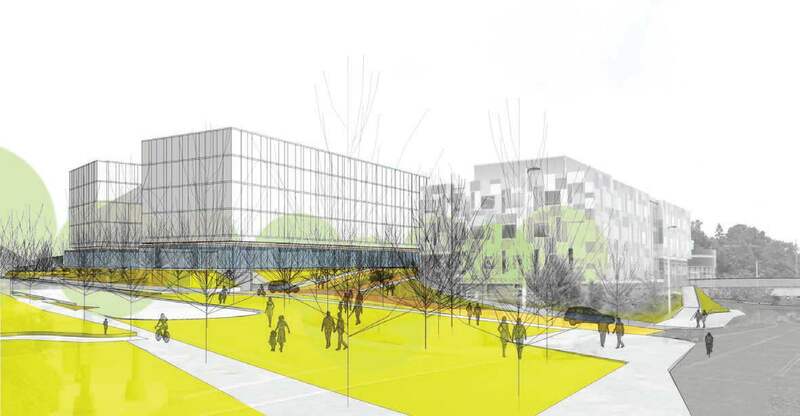 The project proposes a new structure (identified as the “Intersection”) located between two existing buildings (Identified as Buildings B and C) on the Adidas campus. The proposal also includes a new pedestrian plaza along N Greeley Ave.
Four story 39 unit mixed use building with ground floor commercial shell. New single story dental clinic and surrounding site improvements; shell only. Every week, the Bureau of Development Services publishes lists of Early Assistance applications, Land Use Reviews and Building Permits processed in the previous week. We publish the highlights. This post covers September 25th to October 1st, 2017. 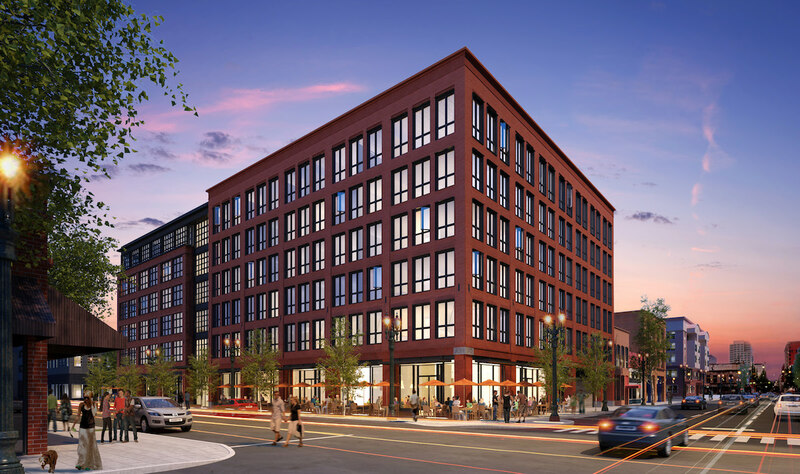 Current Code – New Multi-Tenant retail building with surface and rooftop parking. Construction of new 4-story apartment building (19 units), with ground floor retail and parking. New construction of mixed use building with 114 residential apartments over commercial space. One modification to bike parking. New four-story mixed-use multi-family building with 101 apartment units over ground floor retail and residential services; 35 on-site parking stalls Septic Decommissioning Required. Call for Inspection 842. The Historic Landmarks Commission has approved a mixed use development at SW 3rd & Ash. The building by GBD Architects for Downtown Development Group will include 133 residential units, 20% of which will be reserved for people earning no more than 80% of Area Median Income. 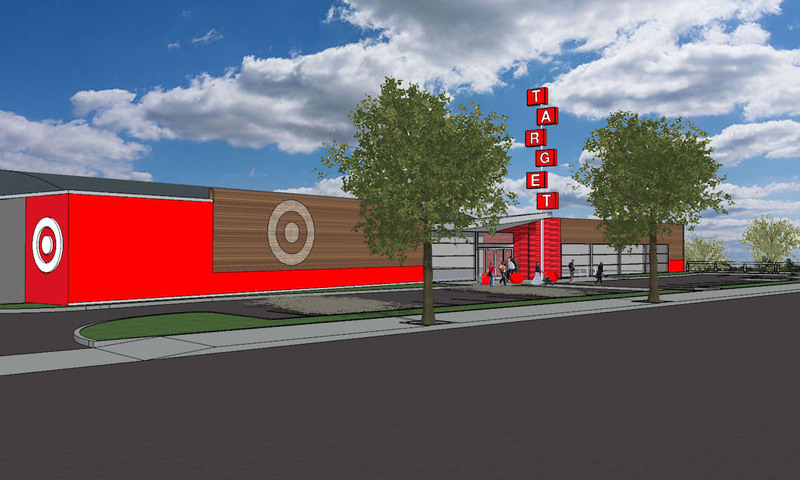 At the ground level 8,640 sf of retail space is proposed. Parking for 63 vehicles will be located in one level of underground parking. Long term parking for 250 bicycles will be provided. The Business Tribune wrote about the Design Commission’s 2017 State of the City Design Report. The Oregonian wrote about how Oregon is pushing for wooden skyscrapers, including Carbon12 and Framework, to revive the state’s timber industry. As the Portland City Council approved tax breaks for seven new buildings, in exchange for affordable housing, The Oregonian reported that Commissioner Nick Fish questioned whether the proposals go far enough. The exemptions were granted for Con-way Block 290, 2216 NW Pettygrove St, SW Park and Columbia, SW 3rd & Ash, The Atomic Orchard Lofts at 2520 NE Sandy Blvd, Old Town Chinatown Block 33, and Woody Guthrie Place at 5728 SE 91st Ave.
BikePortland reported that amid stiff opposition, the city council ordinance required for the Portland Art Museum’s Rothko Pavilion was placed on hold. The Portland Business Journal wrote about how PSU is on the final stretch of work on the Karl Miller Center, the expansion of renovation of the university’s School of Business Administration. The Portland Tribune reported on an error by Portland Public Schools that resulted in the award of a design contract for the Madison High School Modernization to a firm that scored lower in the evaluation process. Design Advice Request for a new 6-story mixed-use building with approx. 8,925 SF of retail, 133 market-rate apartments and 63 off-street parking stalls on one level of structured underground parking. Renovation of existing building to include retail and commercial uses along Sandy Boulevard and development mechanic’s shop into commercial bakery. Existing parking to be converted to public amenity space. Develop the parcels into condos. The house on the west parcel will be demo’d. The house on the east parcel will remain. Multi-phase, multi-family development on multiple lots. Looking at possibly consolidating lots to help minimize interior setback requirements. They are hoping to meet community design standards. Get space self-storage facility with associated parking, utilities, and landscaping. New 4 story mixed-use building including 61 living units over retail and 23 parking stalls. Pre-application conference to discuss a Type III Design Review for a new 30-story, mixed-use tower. Demo existing building, new development of 6 story 100 residential apartment building with ground floor retail and underground parking. 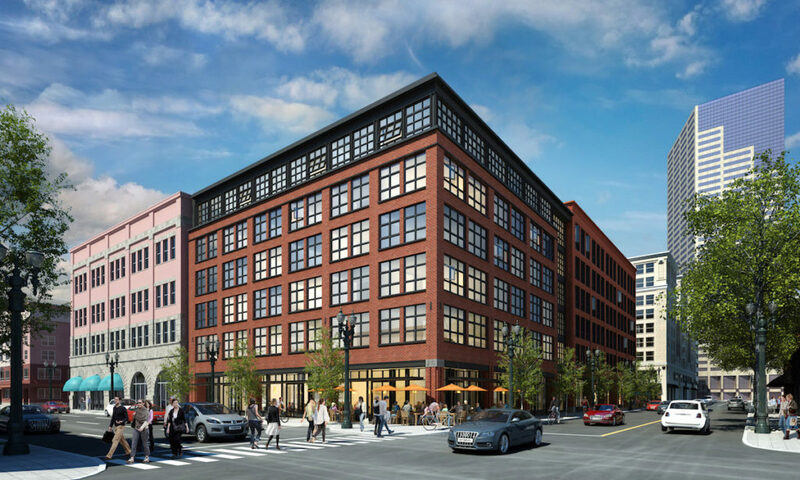 Renovation of existing 3-story, 150k SF anchor into multi-tenant use. 22-story high-rise residential project- of approx 212,000 SF above grade. New 6 story apartment building with 112 units and tuck under parking. The Partial Permit scope of work includes: a) erosion control; b) ground improvements; c) shoring d) tiebacks; e) excavation and earth work; f) deep foundations; g) foundations; h) basement-level mat; i) basement walls and j) at-grade post tension slabs. Also includes all mechanical, plumbing and electirical installation up to level 1 slab. Separate MEP permits required for this work. 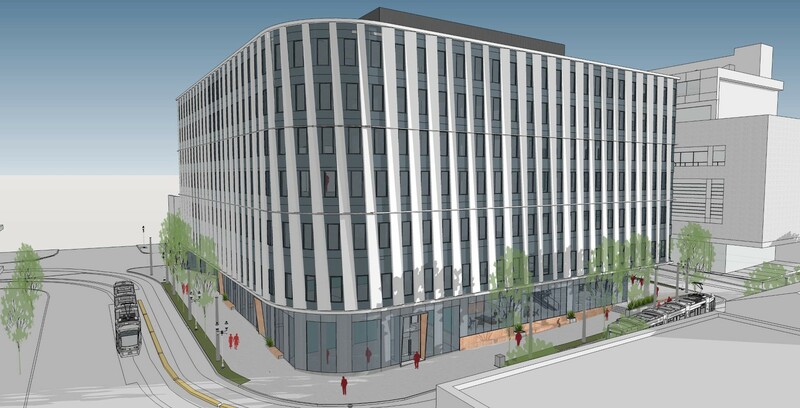 GBD Architects have scheduled a Pre-Application Conference to discuss a mixed use development at 108 SW 3rd Ave. If the project goes ahead it could be the first development on the Goodman family owned “Ankeny Blocks” in Downtown / Old Town. A proposal released earlier this year envisioned that the collection of properties could be redeveloped with 11 new buildings, representing $1.5 billion in investment. 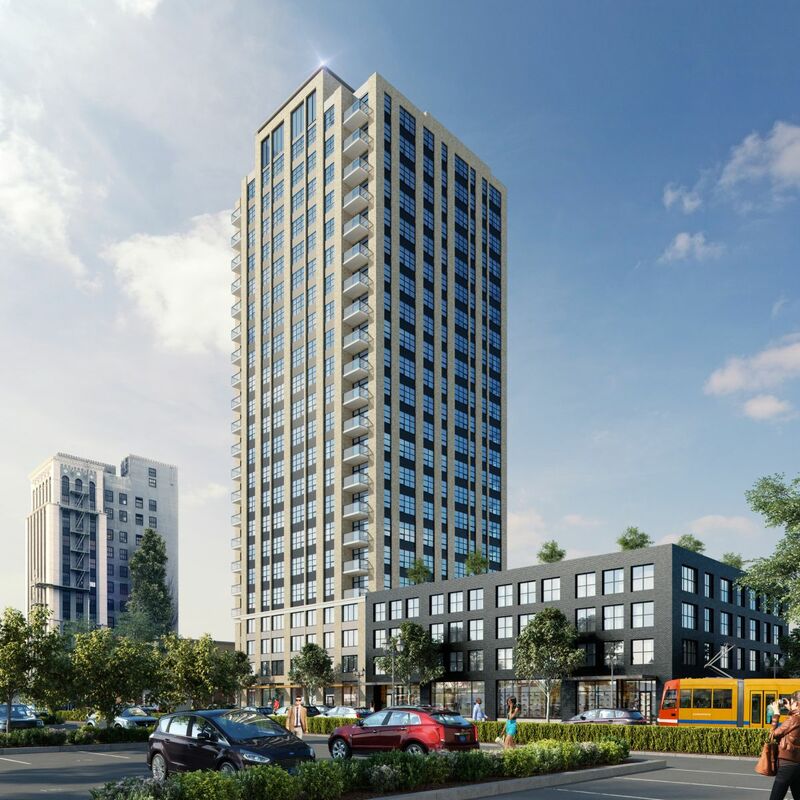 Drawings submitted to the City for the Block 31 site show a 6 story building with 120 market-rate residential units and 63 below-grade parking spaces. Approximately 9,000 sq ft of retail space would be located at the ground floor. Ecoroofs, an amenity deck and a community garden are shown at the roof level of the building.